i-ENVY by Kiss is launching a very special collection dedicated to fashion-forward lash lovers. The brand-new Iconic Collection has been designed around three of today’s hottest makeup trends, and our lash experts and makeup artists have teamed up to create four stunning styles for each. With 3D Angle and Volume Technology that perfectly sets off each look, the results are a stylish treat for every makeup lover no matter what the occasion. Dedicated to fashion-forward lash lovers, KISS I-Envy Iconic Collection CHIC ICON 01 (KPEI01) Lashes are made to complement cat eye or smoky eye styles. Their unique spiky design is crafted to up the intensity and bring out the chic in any dramatic eye look. Dedicated to fashion-forward lash lovers, KISS I-Envy Iconic Collection CHIC ICON 02 (KPEI02) Lashes are made to complement cat eye or smoky eye styles. Their unique spiky design is crafted to up the intensity and bring out the chic in any dramatic eye look. Dedicated to fashion-forward lash lovers,KISS I-Envy Iconic Collection CHIC ICON 03 (KPEI03) Lashes are made to complement cat eye or smoky eye styles. Their unique spiky design is crafted to up the intensity and bring out the chic in any dramatic eye look. Dedicated to fashion-forward lash lovers, KISS I-Envy Iconic Collection CHIC ICON 04 (KPEI04) Lashes are made to complement cat eye or smoky eye styles. Their unique spiky design is crafted to up the intensity and bring out the chic in any dramatic eye look. Dedicated to fashion-forward lash lovers, KISS I-Envy Iconic Collection GLAM ICON 05 (KPEI05) Lashes are designed to give a little extra edge when the moment calls for shimmery and glittery makeup. Dedicated to fashion-forward lash lovers, KISS I-Envy Iconic Collection GLAM ICON 06 (KPEI06) Lashes are designed to give a little extra edge when the moment calls for shimmery and glittery makeup. KISS I-Envy Iconic Collection GLAM ICON 07 (KPEI07) Lashes are designed to give a little extra edge when the moment calls for shimmery and glittery makeup. Dedicated to fashion-forward lash lovers, KISS I-Envy Iconic Collection GLAM ICON 08 (KPEI08) Lashes are designed to give a little extra edge when the moment calls for shimmery and glittery makeup. 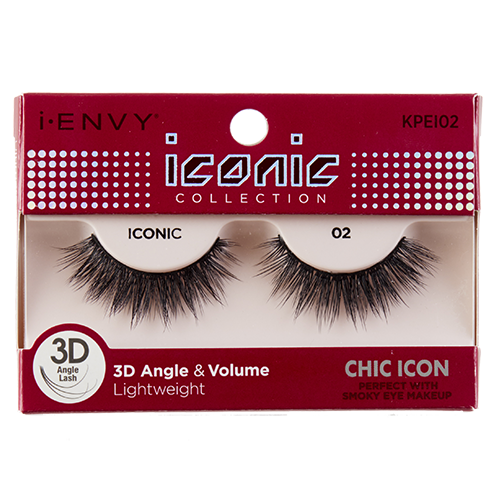 Dedicated to fashion-forward lash lovers, KISS I-Envy Iconic Collection NATURAL ICON 09 (KPEI09) Lashes are a classic style that make the perfect pairing for your everyday, pastel and even bare-eye looks. Dedicated to fashion-forward lash lovers, KISS I-Envy Iconic Collection NATURAL ICON 10 (KPEI10) Lashes are a classic style that make the perfect pairing for your everyday, pastel and even bare-eye looks. These are the perfect false eyelashes to open up your eyes. Good for everyday wear at work or evening night out. 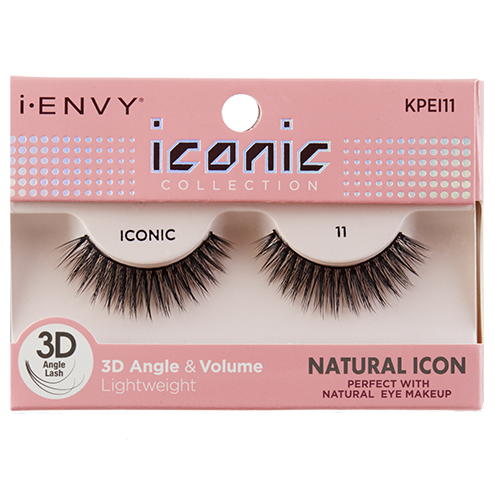 Dedicated to fashion-forward lash lovers, KISS I-Envy Iconic Collection NATURAL ICON 11 (KPEI11) Lashes are a classic style that make the perfect pairing for your everyday, pastel and even bare-eye looks. 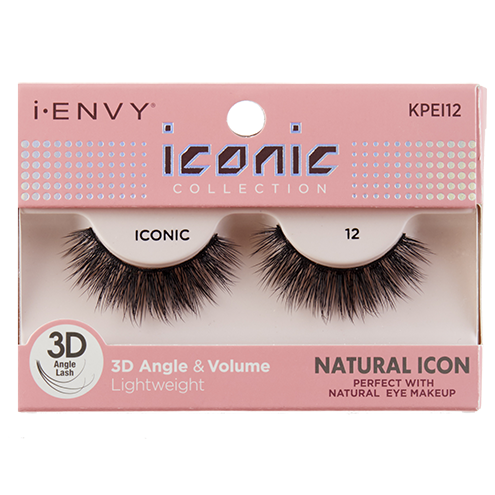 Dedicated to fashion-forward lash lovers, KISS I-Envy Iconic Collection NATURAL ICON 12 (KPEI12) Lashes are a classic style that make the perfect pairing for your everyday, pastel and even bare-eye looks.